Clever, cool, sassy teenage sensation Lorde expands the Tennis Court EP into a full album. Arriving just in time to deliver an antidote to the current wave of pop sensationalism, this world-weary old soul in a teenage body keeps its’ clothes on and performs without writhing around, caressing phallic mallets in it’s underwear. Even though you just can’t help compare her to Lana Del Rey, unlike Lizzy Grant’s alter-ego, kiwi Ella “Lorde” Yelich-O’Connor doesn’t make you want to go slash your wrists in despair. Lorde’s deep, smokey voice will melt ice at thirty paces and manages to mix hip-hop with the jazz clubs; there are too-cool-for-school musings that veer from the poetic and hip (“Pretty soon I’ll be getting on my first plane/ I’ll see the veins of my city like they do in space”) to moody commentary on teenage episodes(“The drink you spilled all over me/ Lovers spit left on repeat”), and a catalogue of insecurities. It’s an album that can be detached and a little too knowingly arch; debut track Tennis Court and the multi-platinum single Royals manage to combine a pop aesthetic with a quirky awkwardness, the introspective outsider looking in. It sounds and feels far more authentic than Del Rey’s artificially constructed arias or any amount of record-industry, middle-aged second-guessing of the ‘yoof’ market. It’s not about a market; you get the feeling that Lorde doesn’t care if you listen in or not, that’s your choice. She’s going to make her own music her own way and experiment how she likes, just so long as the quality of the finished article holds up. What you get is a mature work by a serious artist who’s not interested in cheap publicity and notoriety, and is worth a listen for that alone. 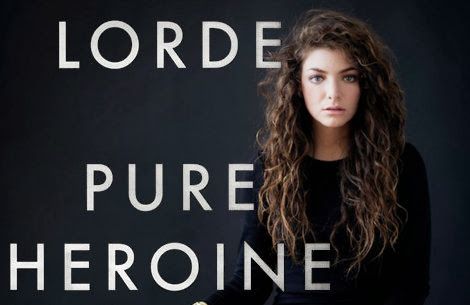 Clearly well read, Lorde’s songs artfully mix clever wordplay and layered vocal harmonies. While the stripped down production (care of Joel Little), all chilled beats and minimal backing tracks, help leaven the tone, there’s just very little light and shade. It’s not a difficult album, but I have to concede after repeated plays, I roll into track ten and realise that not a lot has happened since the two singles at the beginning. In interviews with MTV News, Lorde had admitted that she doesn’t wholly stand by some of her previous songs (specifically “Million Dollar Bills”) but that “Ribs” is a song that she’s still excited about . Perhaps because that even in its utter childishness, it’s the most mature track on the album.